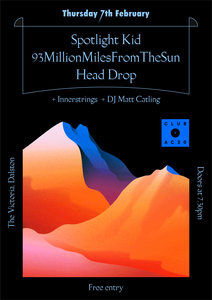 Feb 2019's installment will be Spotlight Kid, 93MillionMilesFromTheSun and Head Drop with DJ Matt Catling on the decks, and Innerstrings doing the visuals. 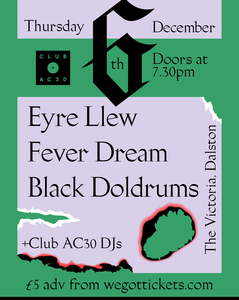 The fourth installment will be Eyre Llew, alongside Fever Dream and Black Doldrums with resident AC30 DJs on the decks. Doors at 7.30pm, £5 adv. 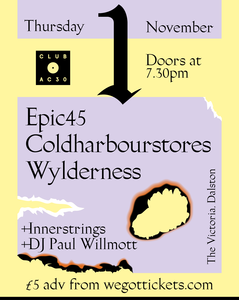 The third installment will be epic45, alongside Coldharbourstores and Wylderness. Visuals for the night will be provided by Innerstrings, and Paul Willmott will be on the decks. 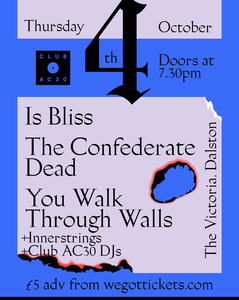 Second up will be Is Bliss, alongside The Confederate Dead and You Walk Through Walls. Visuals for the night will be provided by Innerstrings, and Club AC30 DJs will be on the decks. After a hiatus of four years, Club AC30 are back with gig nights in London, with a residency at The Victoria on the first Thursday of each month (from September 2018 onwards). 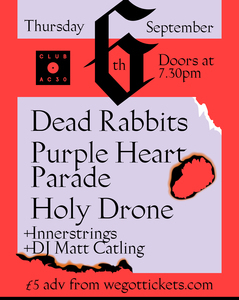 First up will be Dead Rabbits, alongside Purple Heart Parade and Holy Drone. Visuals for the night will be provided by Innerstrings, and Matt Catling will be on the decks.